In the previous chapter, we created our first custom footprint. We haven’t saved it yet, which is what we will do now. You could go ahead and save the new part in an existing library but since this is our first custom part, it is better if we create a new library for it, and then save the footprint and save it in it. In general, this is a good practice. When you create a new part, it’s usually tied to particular project. So you want to have a library for footprints specific to that project. The New Library And Save Current Footprint button. To create a new library, click on the New Library And Save Current Footprint button. 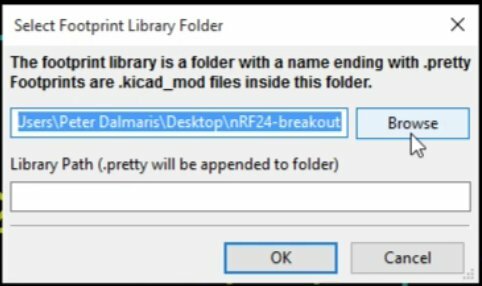 The Select Footprint Library Folder window. Browse to your project folder and save the new library there. Click on the Browse button to browse to the location of our project. Give the new library a suitable name. Give this library a name, something like “NRF24 footprints”. 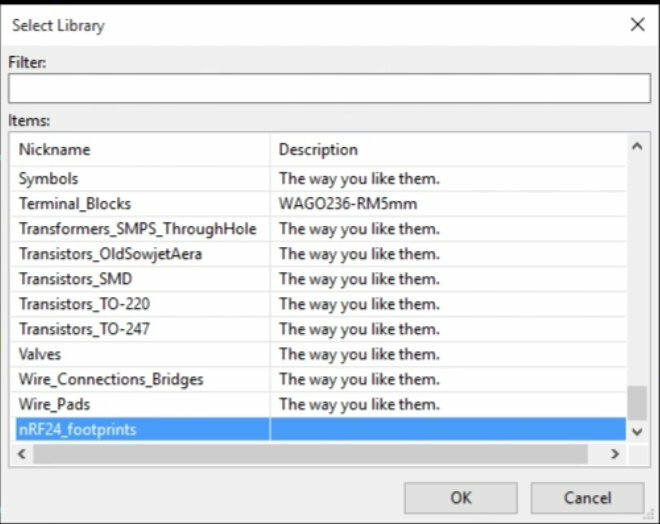 The Footprints Library Folder is updated with the library path and name. 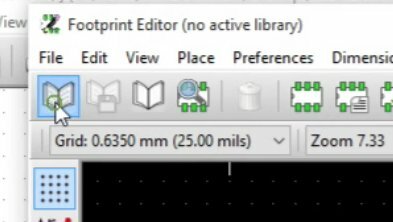 Click OK. Kicad will save this new footprints library. Go to your project folder to verify. In the project folder, notice a new folder named “NRF24_footprints.pretty”. 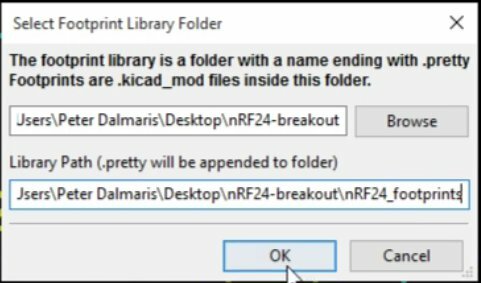 Go inside this directory, and notice a file with the Kicad_mod extension to it. This file contains the new footprint. 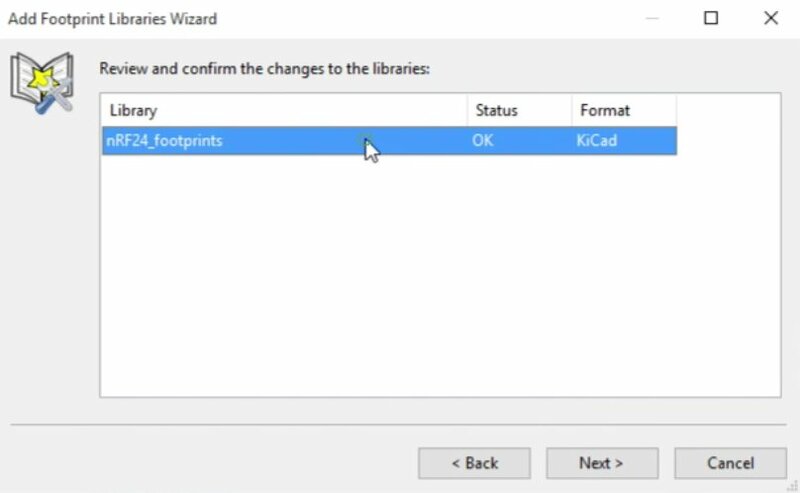 To make a library active, start by starting the Footprint Libraries Wizard. We start by importing the library to Kicad. 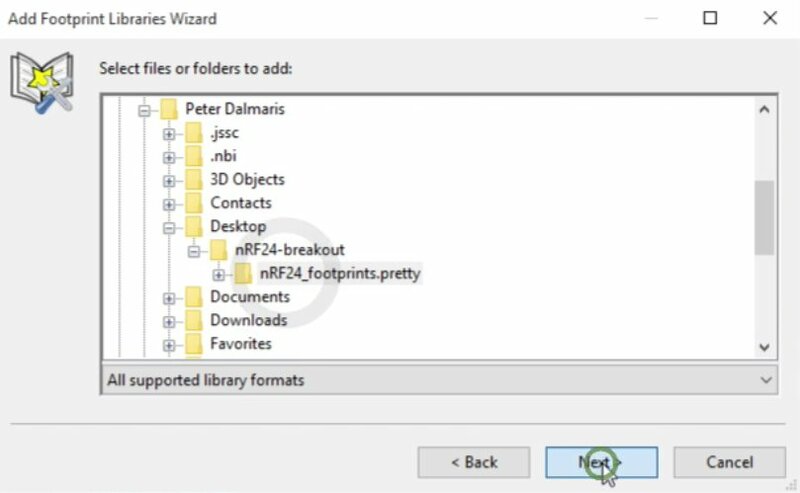 In the preferences menu, start the Footprint Library Wizard. Browse to the location of the new library, in the project folder. Look for the new library inside the project folder. The wizard confirms that what we selected is a valid footprint library. You can choose to make this library global or active for the current project only. 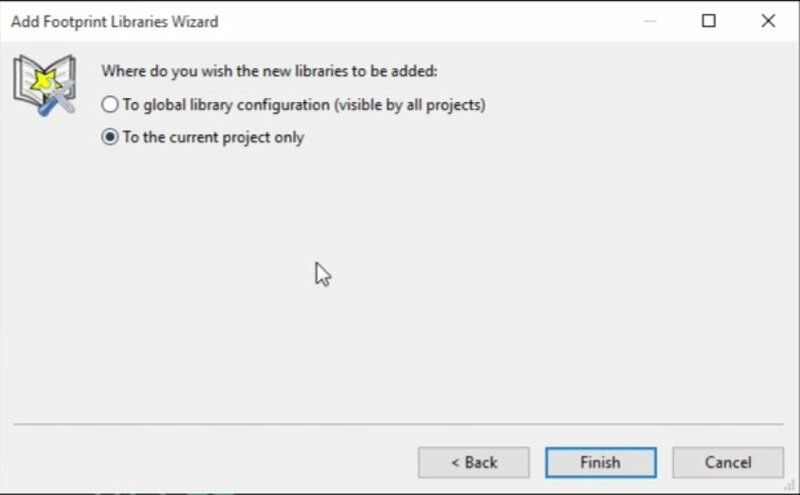 We will only use this library in the current project only so select the appropriate option in the last step of the wizard, and click on Finish. The last step before we can finally save the footprint is to make the library active. I know this doesn’t make much sense. Why do you need to make the library active, and then save the new footprint in it? I don’t know but that’s how it is with Kicad. Unfortunately, some things don’t make intuitive sense. To make the library active, click on the select active library button. Scroll down the list of libraries that Kicad knows about, until you find our new library. Select it and click OK.
Scroll down to the bottom to find the one we added. The name is NRF24_footprints. Click OK. This is now the active library. 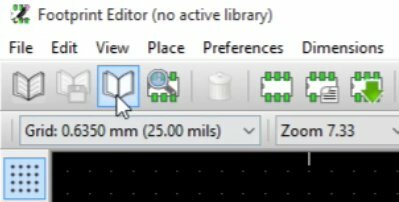 The name of the active library is shown at the top of the Footprint Editor window. 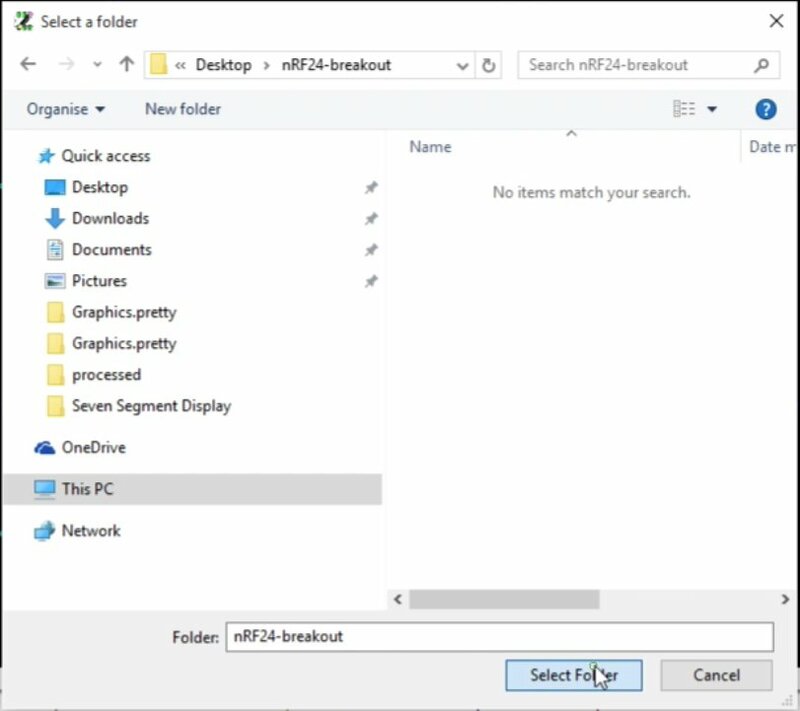 You can see that the name of the active library appears at the top of the Footprint Editor window. Finally now, click on the Save Footprint In Active Library button, and give a name for the footprint, or just accept the default. Click OK, and finally, we now have a new footprint stored safely inside a new library that is accessible only by this project. In the next chapter, we will associate the new footprint with its schematic component. What is a Printed Circuit Board? This site is a Tech Explorations Project, maintained by Peter Dalmaris. Have a look at our other projects!